Our Roll-On Perfume oil creates a longer lasting fragrance alternative, while pampering and softening the skin. For an even longer lasting fragrance option, spray your cologne on top of the perfume oil. Roll-On Perfume Oil - a neat, clean, portable way to use fragrance. FROZEN POND: Dazzling and transparent, Frozen Pond is a lovely year-round scent evoking the quiet chill of a winter morning just before dawn. PURPLE IRIS: Deep, full, round and complete. A modern version of a Classic Iris note. *1 - Once your ON-LINE purchase total equals $25 in products, after all promotional discounts, excluding shipping, handling and sales tax if applicable, we'll automatically send you a FROZEN POND 10mL Roll On Perfume Oil. 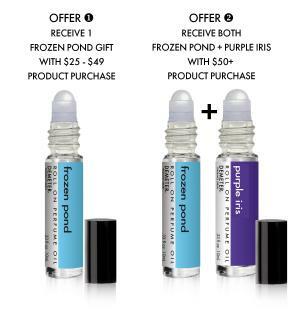 *2 - Once your ON-LINE purchase total equals $50 in products, after all promotional discounts, excluding shipping, handling and sales tax if applicable, we'll automatically send you one each FROZEN POND and PURPLE IRIS 10mL Roll On Perfume Oil. There is no need to add the FREE GIFT to your cart. We will add it to your order at time of shipping AUTOMATICALLY. FREE GIFT may change. Available while supplies last. FREE GIFT cannot be returned for exchange or refund.